The Old Cabin Office and the Newer Visitors Shelter - 100 years of history. 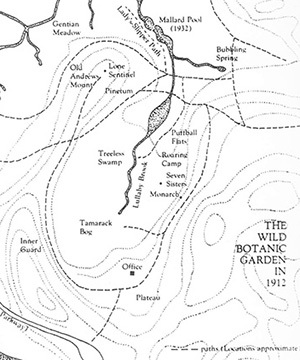 Above: A plan map of the Garden circa 1912-1920. There is no boundary fence at that time. The site of the office and Plateau are at lower center. Map courtesy Martha Hellander. Between 1912 and 1915 several small buildings were added to the Garden. First an old tool shed was moved into the Woodland Garden. 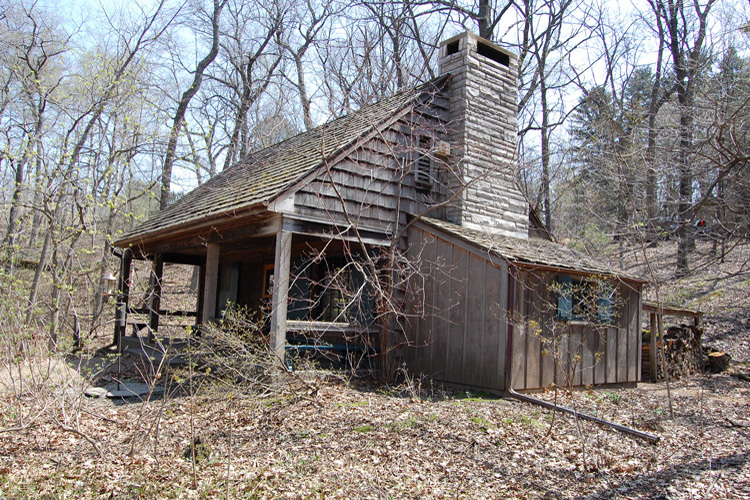 Then in 1915 a larger wood "cabin" was built to Eloise Butler's specifications. She noted its completion in her log on April 9 of that year. The location was uphill and south of the wetland, and downhill from what would become the south entrance, in a spot she called “the plateau”, a flat area about 1/2 acre in size. The building was divided into two sections, one part serving as a tool room and the other served as office, visitor center, shelter and all other purposes until 1970 when the new shelter shown below was completed and dedicated to Martha Crone. 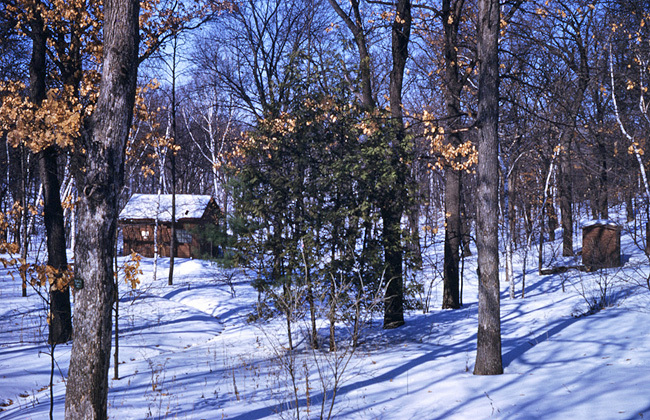 The little building was known as "the little cabin" and as the "garden office". 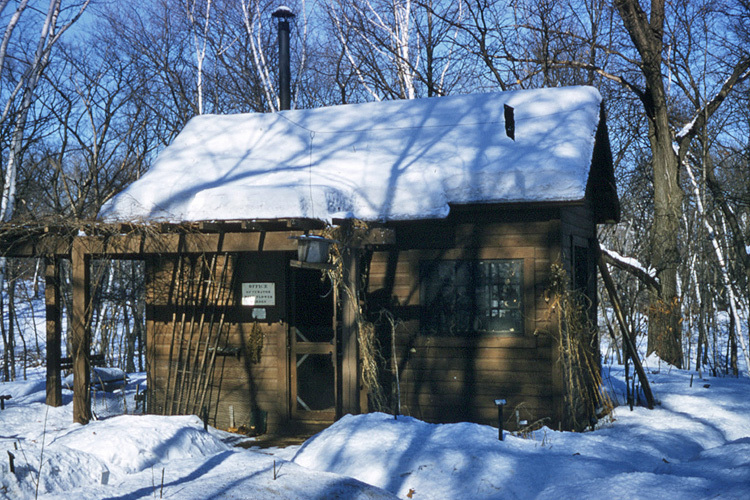 It was for many years unheated but in 1944 Clinton Odell donated a small wood stove and stove pipe, but on cold days Martha Crone would report that water froze in the watering buckets, stove or no stove. 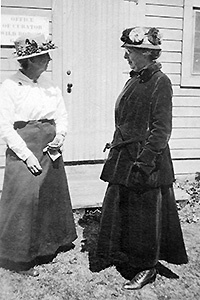 Prior to the wood stove, Martha Crone brought a portable kerosene stove from home and the Park Board furnished the kerosene. With the new building in 1970, the old office was then moved to the back gate of the Garden where it remained for a few years [per Ken Avery's notes, April 1973, The Fringed Gentian™]. The building served Eloise Butler, Martha Crone and Ken Avery for a total of 58 years. These photos span the time from 1917 to 2015. 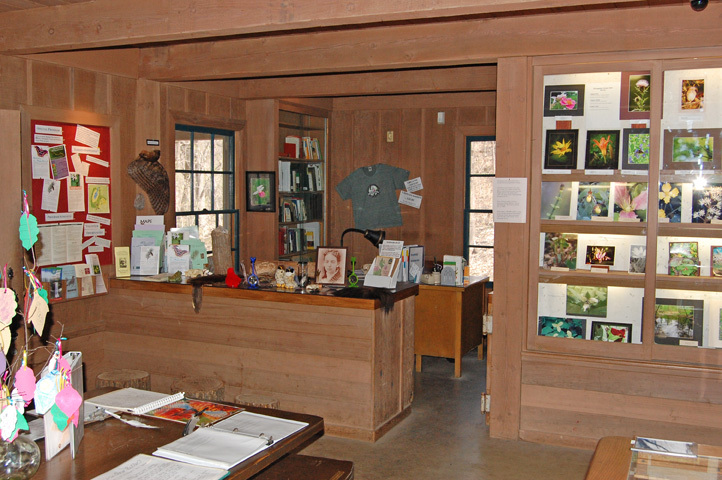 A signboard near the door of the office read "Office of the Curator - Wild Botanic Garden". This stated the original name of the Garden but after a few years it was changed to "Native Plant Reserve", but the sign remained unchanged for many years. The sign is visible about Eloise's head in the photo and in the 1935 photo below. In the photo below from October 2008, we see the current arrangement of the site of the old Garden Office. The boulder with the memorial table is at bottom right. At bottom left are a pair of limestone benches donated by Moana Odell Beim in honor of her father, Clinton Odell. They replaced the old settees in 1960. The old office would have been in the flat area where the patio benches are in the center of the photo. That area, now covered with a thick layer of cedar shavings is underlain with a paver surface. It was around this area that the ashes of Eloise Butler were spread during her memorial service on May 5, 1933. The new shelter sits up a path to the right from just behind the boulder. The photo below was taken on Feb. 29, 1936 (leap year day). Note that neither this photo or the one above show a chimney for a stove. 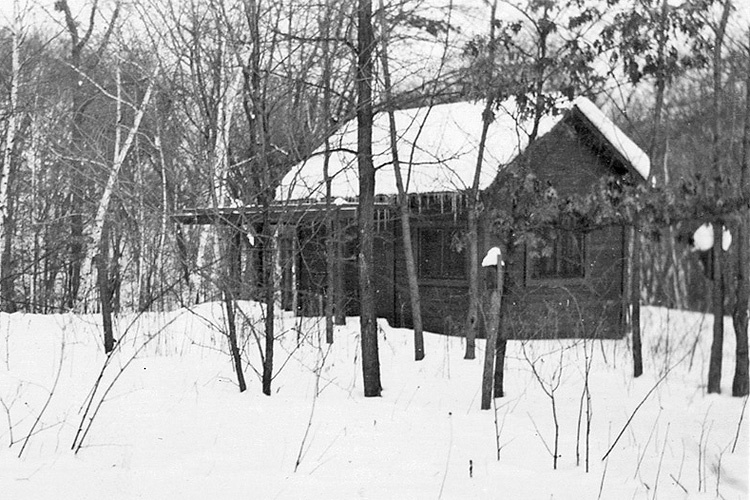 Photo Below: The little cabin in February 1956. The stovepipe for the small stove added in 1944 is clearly visible on the roof. The sign by the front door changed often over the years. This one reads "Office of Curator - Wild Flower Garden". Earlier the sign had read "...Wild Botanic Garden." 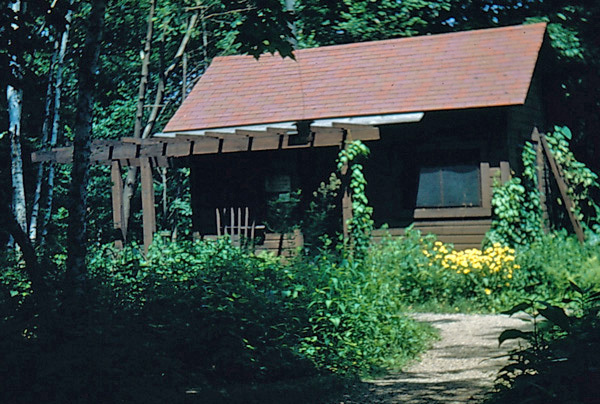 Photo below: The current Garden Office and Visitors Shelter, built by the Friends of the Wild Flower Garden and given to the Minneapolis Park and Recreation Board in 1970 with a dedication to Martha Crone. Photo G D Bebeau. 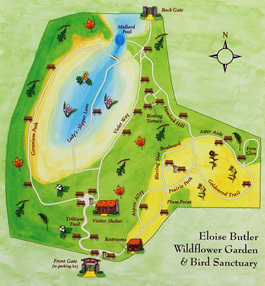 Above: The current map of the Garden - the plateau is where the Visitor Shelter and benches are indicated. Map courtesy Minneapolis Park & Recreation Board. 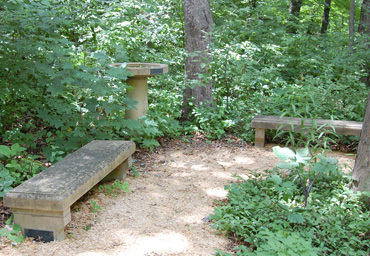 Above: A detail of the pair of Kasota limestone benches, dedicated to Clinton Odell and presented by his daughter, Moana Odell Beim; they were installed in 1960 and replaced the pair of wooden "settees" shown in the 1935 photo. Clinton Odell was the founder and first president of The Friends of the Wild Flower Garden. Moana Odell was president of The Friends 1975-1976. 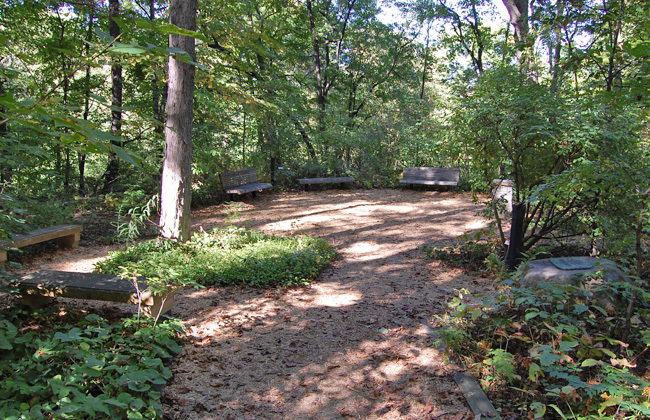 The bird bath between the two benches, also of Kasota limestone, is dedicated to Amy H. Odell, spouse of Clinton Odell, and presented by family and friends. Below: Ken Avery stated that the small tool sheds occupied the spot where the new Shelter was built. (Fringed Gentian™, Vol. 23 No. 4 October 1975). He called them "little half-tumbled down shacks." One is visible at the right in this photo from March 9, 1953. Note the small group of red cedars in the center of the photo - that is the site of Eloise Butler's 1917 boulder birdbath. 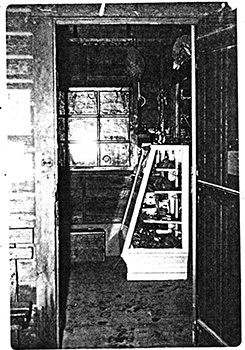 Below: An interior view of the Martha Crone Visitors Shelter. 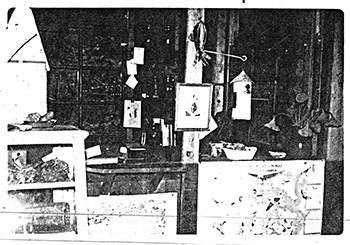 For a complete history of the creation of the Martha Crone Visitors Shelter see this article: "The Old Office Replaced."